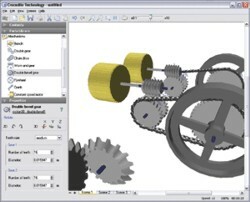 Crocodile Technology 3D's electronic design tools have been refined over the past 12 years. Whether or not you plan to simulate a PCB in 3D, you'll find the 2D electronic simulation tools indespensible. If you're making a PCB, it's the starting point for creating your circuit: drag the components you need from the toolbars, draw wires between their terminals with the mouse, and edit component values and properties at will. If you're not making a PCB, and just want to simulate or test a circuit, you can use exactly the same tools. For many components, you can now choose from a range of different component models, to fit with the real components you're using. For example, the simulation now offers 9 different NPN transistor models: BC548B, BC639, BC108, 2N3053, BFY51, TIP120, BCX38B, TIP31C and ZTX321. These are automatically passed to the PCB. Crocodile Technology 3D integrates programmable control with electronics, allowing you to programs microcontroller chips such as PICAXE or PIC. Programs are developed using a simple flowchart interface, which we've refined over recent months. Choose a Start command first, and then build up your program - choosing from decision boxes, processes and output commands. Editing of commands and expressions is straightforward - just click on the command. And you can use subroutines to create more complex programs, and introduce variables to store numbers. You can watch your program running, which makes modifying and debugging straightforward. Runtime errors and syntax errors are highlighted, and can be corrected quickly using the mouse. There is a range of simulated microcontrollers available, which you can wire into your circuits - as you would with the other electronic components. Crocodile Technology 3D is the first simulator to offer schools full simulation of PCBs in 3D. To create a 3D PCB, first add a PCB part. This is a box with two design spaces: a 2D schematic space, and a 3-dimensional PCB. Next, build the 2D circuit in the 2D space. When you're happy, and the 2D simulation works as you want it to, you can convert it to a 3D PCB. 3D versions of your components will automatically have been added to the 3D space. You can position these where you wish on the board, and also edit the size and shape of the board. This is especially useful where component placing is important in the finished product - for example, with controls, mechanisms or outputs. 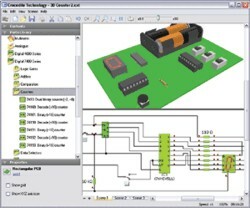 Crocodile Technology 3D includes a full version of our PCB design software, real-PCB [Windows version only]. Normally, this runs in the background, handling the automatic placing and routing of the PCB components. If you wish, though, you can choose to specify key settings, such as track width and component spacing; alternatively, you can open real-PCB to edit the PCB manually, and then pass your changes back to the 3D simualtion. Choosing the quick autoroute and autoplace option, though means that after a couple of clicks and a few seconds' wait, you have a working PCB layout - in full 3D. You can interact with inputs, like switches or controls, in either the 2D or 3D windows, and both views are updated simultaneously. You can flip or rotate the board to any angle you like, and edit placements or reroute tracks easily. 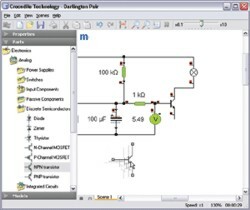 As well as simulating PCBs in full 3D, Crocodile Technology 3D lets you add electromechanisms - such as motors, microswitches and generators - and a range of mechanical components. Mechanical components are straightforward to use: they snap together automatically, and can be moved and rotated in each of the 3 dimensions. Gears can now have fine, medium or coarse teeth; you can set their diameter exactly, and choose any number of teeth for each gear. Gears can be linked directly to each other, or using a chain drive of any length. To change the direction of rotation, worm and bevel gears are also available. A range of wheels can also be used, and there's even a crank to move the mechanisms manually. Arrows highlight the directions of rotation, and parameters can be plotted on the graph, too. Using 3D makes mechanisms much more flexible: after all, real mechanisms are 3D, not 2D. The ability to rotate and flip the view makes it much easier to understand and modify the design. Accurate measurement is vital, and Crocodile Technology 3D gives plenty of options. Add the new digital multimeter to the 3D space to check voltages around your circuit. You can drag the two probes around the board, and attach them to component terminals. In the 2D simulation, holding your mouse over wires and components gives instantaneous readouts of quantities like voltage, current and power. The graph tool is a powerful ally, too - plot a wide range of quantities, both electrical and mechanical, and tune the axes to display readouts exactly as you wish.